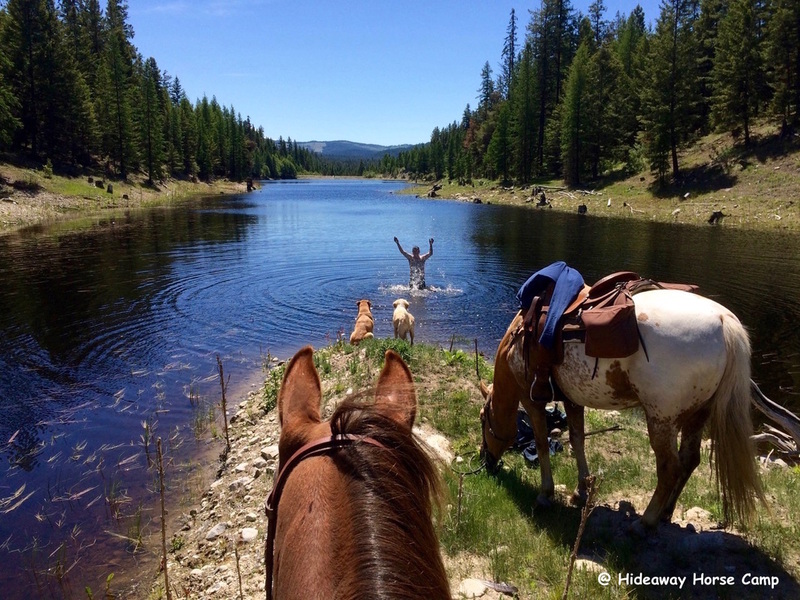 Take a look at Hideaway's little perks that make us the best in rustic horse camping! - Only 4 sites which will insure a quiet and private holiday. - The best little outhouse in the southern Okanagan with water and sink. - Lots of great cold water from our deep well. - Use of the Hut. A rustic cozy place to get out of the sun or rain. Equipped with a cooking table, a small table to eat at and lots of chairs, it is a great place for guests that camp with tents, giving them a place under cover to cook, eat and hang out. NEW FOR THE 2017 SEASON!!! -- We've just finished building a large overhang attached to the Hut! Our guests appreciated the trial, tarped overhang last year, so we think our new, permanent and much larger overhang will be even better. - Communal fire pit and free firewood provided. - Forgot your chairs to sit around the campfire? We have lots that you can use. -Use of 2 large picnic tables in the social area with cooking platforms to place your stove. - Still have energy after riding all day? Have fun with our cowboy golf game. - One map of trails provided. Extras available for $5. - Since cell service is sporadic, a sign-out book will also be available to let us know which area you plan to ride each day so we will know where to start looking if you fail to come back. Cell phones can be recharged at our outside plug. Our home phone can be used for emergencies or if someone back home needs to contact you. Each campsite is guaranteed to have one, separate, double corral. Each individual corral measures 14 ’x 14’. Dividing rails can easily be removed to make one corral measuring 14’ x 28’. - Corrals are surrounded by trees and are quite shady. - Plenty of clear, beautiful water from our deep well. - Bring your own water bucket and hay. - No high lining or private pens please. - Clean your own corrals at least once a day please. Wheelbarrow and manure fork provided. Please put all manure in bin located near outhouse. - Mounting "rock" provided just outside our front gates. The best Little Outhouse in the Southern Okanagan. Tall stories being shared in the Hut. The mounting "rock" in action.